DETROIT CREAMERY VELVET BRAND photo picture print for sale. 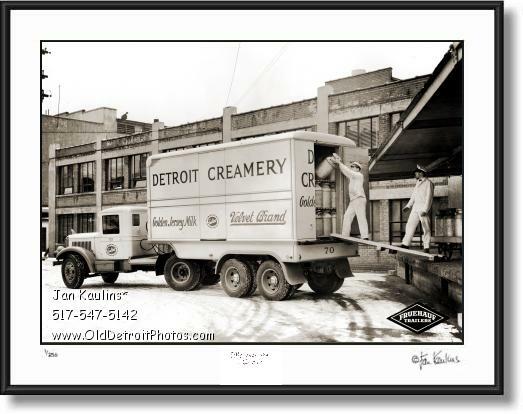 This unique DETROIT CREAMERY Golden Jersey Milk Velvet Brand photo picture print for sale is of two milkmen on a ramp loading the back of their DETROIT CREAMERY truck with large milk cans. Behind them is the historic old DETROIT CREAMERY building. The quality of this image is excellent, having been made from an Original Fruehauf Trailers negative/photo. You can see the Fruehauf Trailers logo at bottom right corner of this historic DETROIT CREAMERY photo.